What a difference an episode makes. Queen Takes Knight, the midseason finale of Gotham, impressed me with its mixture of action, genuine drama, and even comedy. It still had those twists that didn't sit too well with me but unlike Things That Go Boom, this time I wasn't thinking it was too wild a twist. Sofia Falcone (Crystal Reed) finds herself attacked on all sides. Not only are Oswald Cobblepot aka The Penguin (Robin Lord Taylor) and Captain James Gordon (Ben McKenzie) both working to get her out of Gotham, but now the big guns have been pulled out. None other than Don Falcone himself (James Donan) has come at Penguin's request to get his errant daughter out of the way. She finally sees defeat, and it looks like it's all over, until a random hit squad takes out Don Falcone and injures Sofia. Penguin stubbornly insists he had nothing to do with the hit on the Falcones, but he isn't believed. At the funeral, Victor Zsasz (Anthony Carrigan) pays his respects to the Don by leaving a bullet in his casket. Former Captain Harvey Bullock (Donal Logue) returns, giving Gordon advice: get something solid on Pengy before arresting him. Something does come to him: Sofia informing Gordon that Penguin killed Martin. With this, Gordon goes to arrest Penguin, and Pengy delights in telling him that Martin's 'death' was all a rouse, until Victor turns on Pengy and says Martin is dead. An enraged Penguin promises revenge and is locked up. Now, the Sirens: Barbara Kean (Erin Richards), Tabitha Galavan (Jessica Lucas) and Selina Kyle (Camren Bicondova) find themselves the newest owners of the Iceberg Lounge, thanks to siding with Sofia. Sofia still, however, has a few cards to play while the Penguin is away. Zsasz pledges loyalty to Dona Falcone, and she reveals to Gordon that not only did she have her own father iced but that Professor Pyg (Michael Cerveris) was also part of her elaborate plan. She then kills Pyg and makes it look like Gordon did it. With that, she now has revenge for her brother...and control of Gotham's underworld. In our minor plot, Alfred Pennyworth (Sean Pertwee) still cannot control the debauchery and decadence of our young Master Bruce (David Mazouz). He's too busy carousing and drowning himself in booze and broads to care about anything. They fight and it turns physical. Bruce has legal documents drawn up declaring himself emancipated and fires Alfred. We also touch on Edward Nygma (Cory Michael Smith) still struggling to keep his Riddler persona at bay, while Tabitha struggles to get her former love Butch Gilzean aka Solomon Grundy (Drew Powell) to remember her. Eventually, we get hints that he does remember. Again, Queen Takes Knight is a standout episode. Part of it is the witty dialogue in the script. As Don Falcone is leaving with Sofia, he looks up at the sky. "The Sun never shines here," he observes, pointing out what is both obvious and symbolic of our dark city. When Alfred finds Bruce, he wakes him up with water to his face. "Oh, the Front Page is up," he quips. This dialogue gives the actors great material to work with. Moreover, it gives me as a viewer a greater appreciation for the comedic stylings of Victor Zsasz. Penguin angrily shouts, "How is Jim Gordon beating us?" With a perfectly deadpan expression, Carrigan's Zsasz replies, "Well, every cop in Gotham is behind him. I'm guessing he has great leadership skills". I don't think Gotham has given enough credit to how droll both Carrigan and Zsasz are. 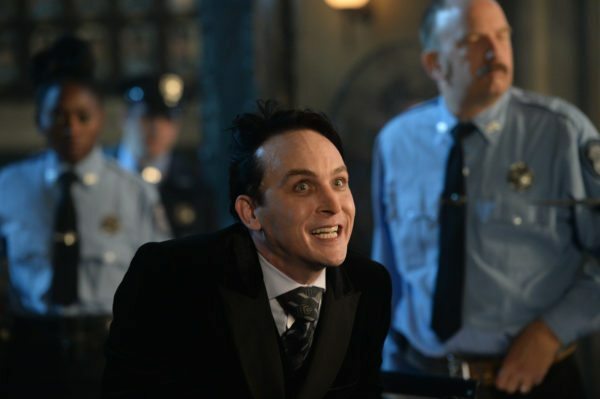 He can be quite dangerous, but Carrigan also makes Zsasz a very funny figure, a mixture of menace and mirth. I think by this point Taylor owns the role of Penguin, and he's set to be the Penguin: not as camp as Burgess Meredith on the Batman TV show nor as grotesque as the Danny DeVito version in Batman Returns. There really is nothing more fun than seeing Pengy in a rage. Taylor is simply the perfect actor for the role not only in terms of talent but in his characterization of the character. He can be menacing, downright bonkers, but also deeply emotional. Whether he is confronting Gordon and the newly-reformed GCPD or expressing frustration at Zsasz's manner, or in screaming out revenge against all his enemies, where he draws the attention of Jerome Valeska (Cameron Monaghan in a cameo), Taylor never ever hits a wrong note. McKenzie too does some outstanding work as Gordon, the good cop who finds himself living a lie to project an important truth. Mazouz as the angry Bruce Wayne, lost in his own dark night of the soul, Pertwee as Alfred, desperate to get his ward on the right track, also do incredible work. It's a shame Doman won't return as Don Falcone, but given that his character was already dying, it seems fitting he was done in by his own daughter. His last scenes were excellent, down to where he slaps Sofia in frustration, a shocking moment to say the least. A real standout is the calm and duplicitous Sofia, played with aplomb by Reed. She does small versus say a Taylor big, but it fits both their characters. One can wonder as to how everything seemed to fall into place for her, but why quibble about such things. Overall, Queen Takes Knight is a strong note to end this half of Gotham. Fine performances, a steady pace of stories, resolutions to some stories (farewell, Professor Pyg) and the teasing of others (Penguin & Joker Together At Last), all brought to a satisfactory close. Here's hoping the second half of Gotham Season Four works just as well.